On any given day, thousands of website owners transfer websites from one provider to another for many reasons. It’s one of the most daunting tasks that a website owner can undergo. I’ve been a webmaster for many years and naturally I have moved a lot of web hosting accounts from provider to provider. I thought I would help by creating a step-by-step guide on how to transfer a website from your current hosting provider to a new one. I’ll summarize what I will cover. First I will walk you through selecting a new hosting provider. This is important as you do not want to continue switching hosting providers. Then we’ll make sure you have your domain ownership in your control. This is very important. Then finally I will take you through signing up for hosting, preparing for the transfer and then verifying everything is completed. Free Site Migration – Find a web host that offers free site migration. You should be in full control of your domain name and the registrant details that are associated with it. Not having this up to date and in your control can be painful later on. Before moving your website, figure this out and make sure the registrant details are in your name and e-mail. Transfer Domain Registrars – This is where you’re switching domain registration providers. All the settings of the domain name itself will remain intact. Your billing and support will change to the new domain registrar. Switching Domain Name Servers – This is where you will be keeping the existing domain registration provider, but you’ll be switching the DNS on the domain name to point to the new hosting provider. If you don’t have any issues with your existing domain registrar, I suggest leaving your domain name and simply switching the domain name servers to the new hosting provider. As I mentioned earlier, I recommend GreenGeeks as they make it the easiest to transfer to. It’s actually a pretty hands off approach — So we’ll use them in this guide. Their web hosting starts from $4.95 per month and offers unlimited disk space, bandwidth, databases, e-mails and more. What’s cooler is they offer a free domain name transfer and renewal for the life of your account with them in addition to the free site migration service that they offer. I’ve also managed to score a special offer from them which will reduce $30 from their already discounted pricing. 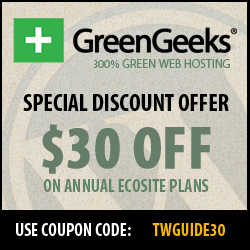 CLICK HERE TO SIGN UP TO GREENGEEKS & SAVE $30! 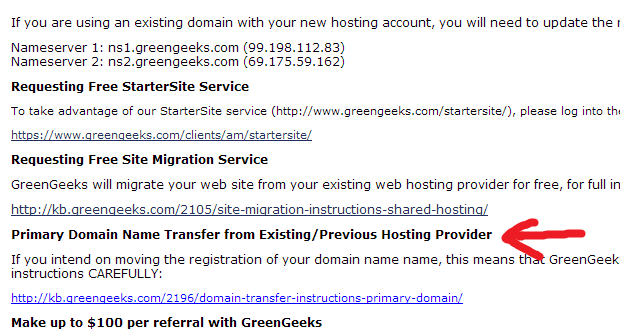 Once you’ve signed up GreenGeeks and your hosting account has been activated, you will receive a welcome e-mail. This will include crucial information regarding your new account. 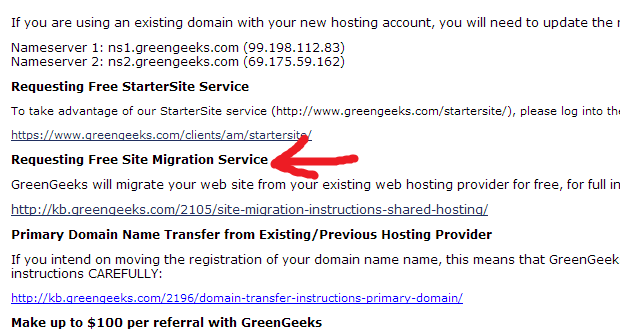 You’ll also see the instructions on how to take advantage of their free site migration service (see below image). This is a god send, time saver, whatever you want to call it. After clicking on the link you’ll be taken to a page that includes instructions on how to take advantage of their free site migration service. You can see that they have thought of everything for when it comes to transferring your website over. GreenGeeks will let you know that your website has been successfully transferred by them from your existing hosting provider. Unless otherwise specified, this usually means that the hosting portion has only been migrated. Test Your Website – This one is self explanatory. Test the functions of your website and ensure that it is working. Also make sure that your e-mail accounts and other features are also working. Wait a week – Keep your old account active for a week or longer. Once you’re certain that everything you need is completely over you can go ahead and cancel your old hosting account. That’s all there is to transfer a website to another hosting provider. Now that you’ve learned the process of moving a website from one provider to another along with the free site migration that GreenGeeks offers, you’ll sleep easier at night when you actually do go through the process of transferring your website!